The monkies' September School Holidays got a tad special this year, which came courtesy of some extremely special magic fairy dust from Hong Kong Disneyland. Yes that's right, the happiest place on Earth that can make kids (and some grown-ups too) ricochet off walls at the mere mention of its name. The wifey and I had originally decided to only tell the kids of our intended destination on the eve of our departure. But who were we kidding? There was no way that we could conceal our excitement for that long and so, the relentless bugging from the monkies ensued... all the way until we hopped onto the Hong Kong-bound plane. 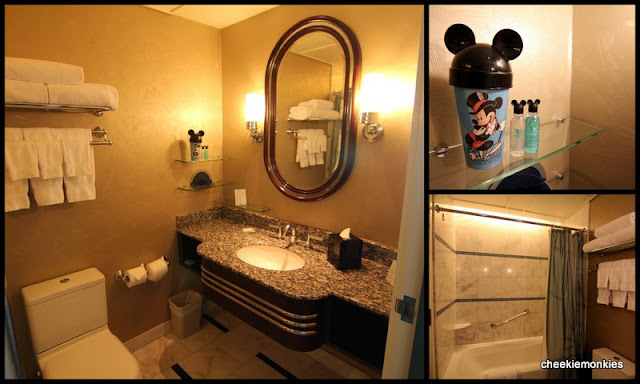 And the excitement factor went a few notches higher when we finally checked into Disney’s Hollywood Hotel. Six years ago, we too stayed at the same hotel and amazingly, the rooms still looked as new as ever. The only change? The 2 boys have grown up quite a fair bit since then. That, and with the addition of a solitary Diva of course. This time around, it was this same Diva who was particularly inquisitive and off she snooped to explore the four corners of our hotel room. And she became rather smug with herself after she had chanced upon some toiletries that were meant for kids. If you ask me, I could just chill in my Sea View Room for a little while longer to soak in the views and catch up on some of my sleep. But guess who wouldn't afford me that luxury? Three monkies and the wifey included, that's who. All because there was still the small matter of hauling ourselves down to Hong Kong Disneyland proper. I don't know about you, but there seems to be something magical about standing along the Main Street, U.S.A. in Hong Kong Disneyland. 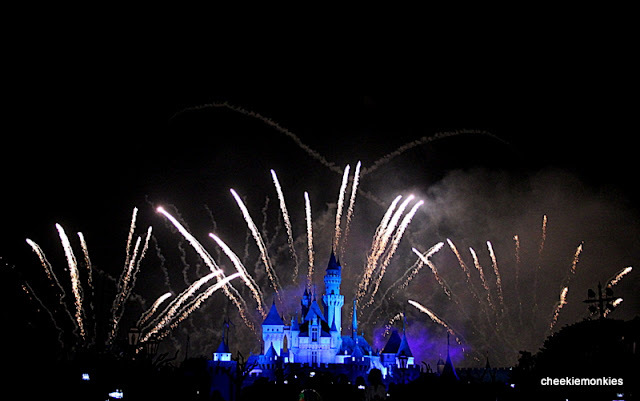 Perhaps it is the piped-in Disney music, or the 20th-century small-town replica buildings, or the sight of Sleeping Beauty's Castle towering in the distance. Suffice to say, the boys were zipping through the park on a high in search of rides that they could unleash their adrenaline on. But those plans had to be put on hold temporarily as the once-per-day Flights of Fantasy Parade was something that we could never miss. Along the way to the park, Ale had actually fell asleep in the her stroller and we had to rudely awaken her from her slumber. Given any other occasion, she would have screamed blue murder at our audacity in cutting short her nap. But this particular time, she woke up abruptly... with a smile to boot on seeing her favourite Disney characters. It is amazing how much power waving Disney Princesses possess. 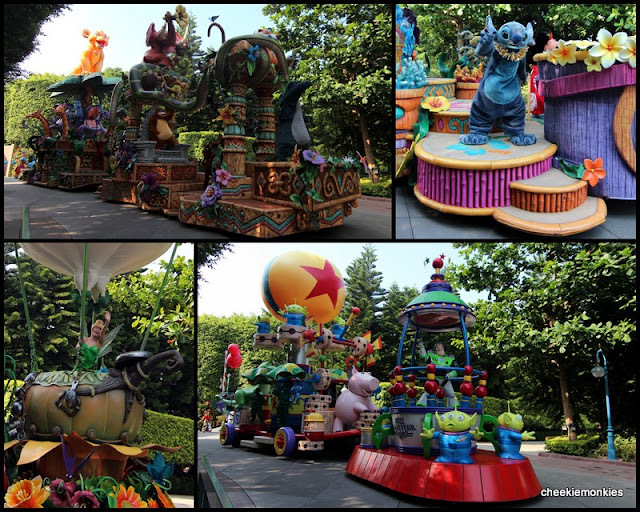 The street parade definitely did not disappoint, with its colourful floats, marching band, lots of dancers... and the occasional Disney character whom one got to high-five as well. Initially, I had thought only Ale would enjoy the parade but it turned out that both Ash and Ayd loved it too and even requested to watch it again during our second day at the park! So we decided to do something a bit different this time around - we found a table at the Corner Cafe at Main Street, plonked ourselves down and and savoured its Magical Afternoon High Tea Set. And all these while, the monkies could carry on watching the parade in air-conditioned comfort while the wifey and I got a much-needed rest. The delectable savouries were definitely most welcomed too! And how satisfying was our high tea? I guess Ayd's expression says it all. 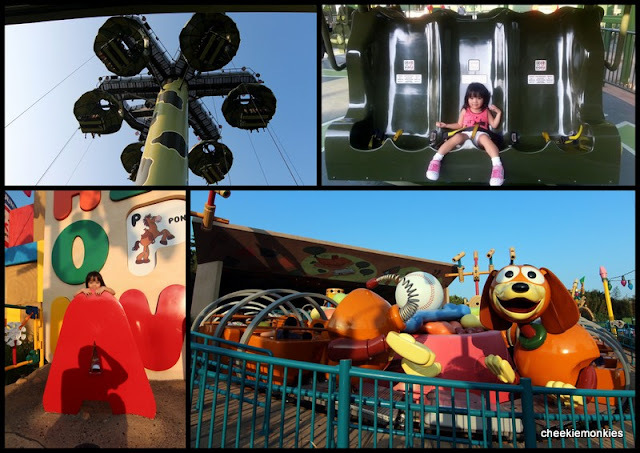 But enough of gorging, time to pump up the adrenaline and it doesn't come any closer in the form of the three new theme areas in Hong Kong Disneyland! Toy Story Land was the first of the three to be opened in 2011, with Grizzly Gulch next in line in 2012 and the final piece in the jigsaw, Mystic Point opened in May this year. 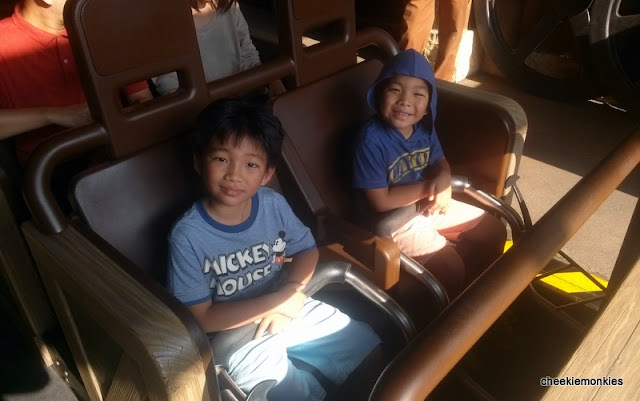 Of the three, the boys have been gunning for Grizzly Gulch most all because of a certain mine-coaster ride. 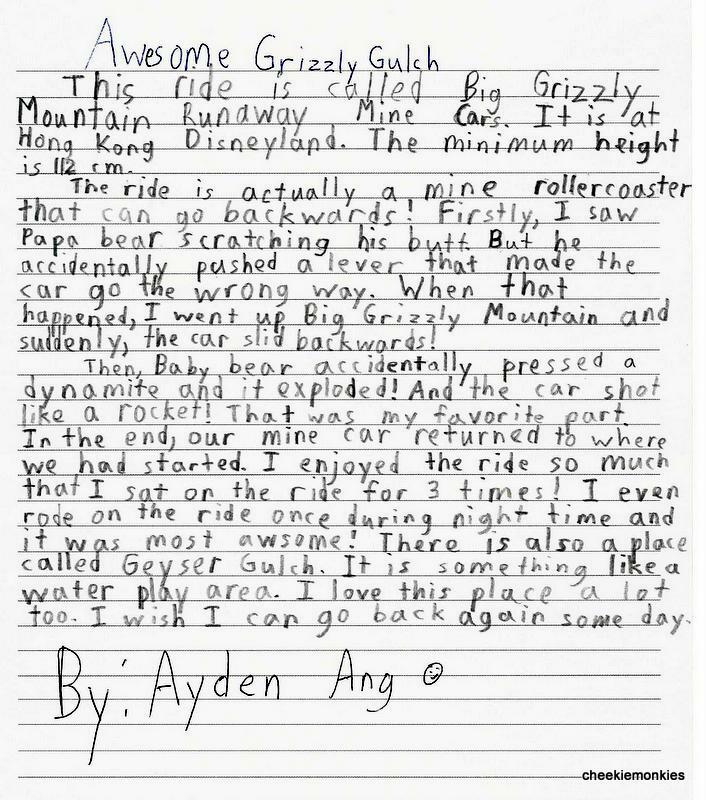 Exclusive to Hong Kong Disneyland, Grizzly Gulch is fashioned to feel like an abandoned mining town set amid mountains and woods. The centerpiece structure is Grizzly Peak, which houses its star attraction - Big Grizzly Mountain Runaway Mine Cars. 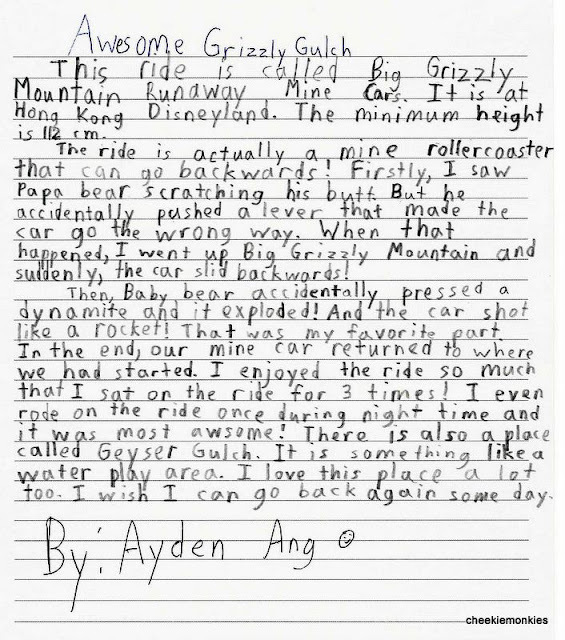 The Big Grizzly Mountain Runaway Mine Cars is a steel roller-coaster where one gets to experience the thrill of riding a fast-speeding mine car careening though and over Grizzy Gulch. Unlike a regular roller-coaster, the Big Grizzly Mountain Runaway Mine Cars (Min. Height: 112cm) does not feature any high plunges or death-defying loops. But what it does have is thrilling speeds and a section of the ride that goes backwards! I have to say, this is unlike any other coaster rides that I have taken. It was definitely a refreshing twist to the usual roller-coaster rides and more importantly, the boys loved it so much... as you can probably tell from below. Saves me the trouble of writing a review, no? Pure genius, I am. ANYWAY... as Ayd mentioned in his review above, the other area that we also spent a fair amount of time was at the Geyser Gulch, a huge water play area designed for one sole purpose - to get people drenched. But it's all in the name of good fun though! The newest kid on the block, Mystic Point, was next on our list. Also exclusive to Hong Kong Disneyland, the premise of Mystic Point is a dense, uncharted rain forest surrounded by mysterious forces and supernatural events. 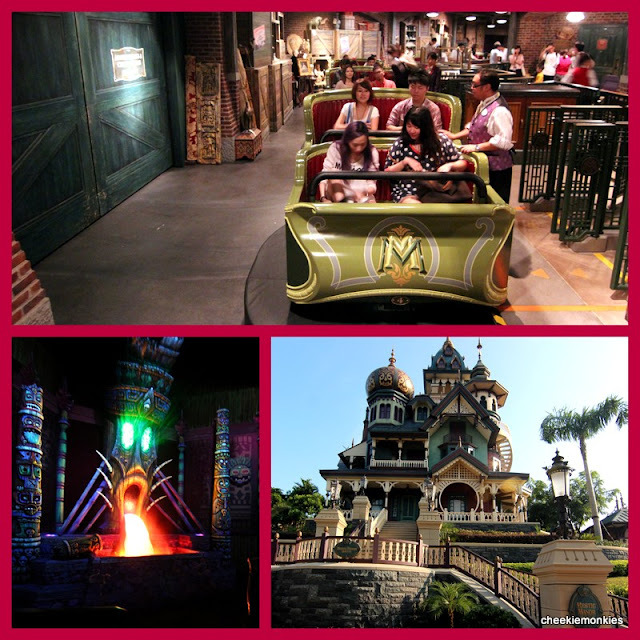 The story of Mystic Point follows the adventures of eccentric explorer and art collector Lord Henry Mystic, who invites guests to board the Mystic Magneto-Electric Carriage for a tour of his private museum located within his Mystic Manor. When Lord Henry’s companion, his monkey Albert, mischievously opens a newly acquired magical music box, the enchanted Music Dust within is released and, accompanied by a haunting tune, a mysterious journey begins. The minimum height requirement for this ride is 82cm which meant that Ale made the cut and our entire family was able to experience the ride together. When I first got onto the carriage, I had initially thought this was just going to be a normal ride where we would be driven to various rooms. Well, I was half-correct. We were ushered into different rooms via our carriage but the experience was anything but normal. For one, I was deeply impressed with the trackless ride system where the carriages receiving directional instruction are operated via radio-frequency identification technology within the floor and Wi-Fi. This meant that the carriages are free to travel throughout the mansion as they are not permanently programmed to one path. Ride-wise, there were a few dark moments but nothing too scary for the young ones overall. In fact, Ale was the first one who remarked that she wanted to go on it again! And we would have acceded to her request if not for the fact that the reason that the ride was so overwhelmingly popular with the rest of the park visitors. The other part of Mystic Point that is worth stopping for is Garden of Wonders, where the ancient sculptures and paintings create some of the most perplexing 3D illusions. And if those illusions manage to not only boggle the eyes but work up an appetite as well, there is the Explorer's Club Restaurant nearby to satisfy those taste-buds. I like the fact that restaurant actually continues the storyline of Mystic Manor, with its different themed seating areas like Morocco, Russia, India, Egypt and China. A Halal-certified restaurant, it serves mainly Asian cuisine like Korean, Japanese, Indonesian (nasi goreng!) and South-East Asian (chicken rice!). We had one of our dinners there and it was a definite welcome change since we were getting a tad jaded from all the usual Western theme park food. The uber-colourful Toy Story Land was the last stop out of the three newest theme areas and personally, this was the one area that I enjoyed the most especially since Toy Story is one of my favourite movies of all time... that is until they build a Star Wars Land in Hong Kong Disneyland. One can dream, right? 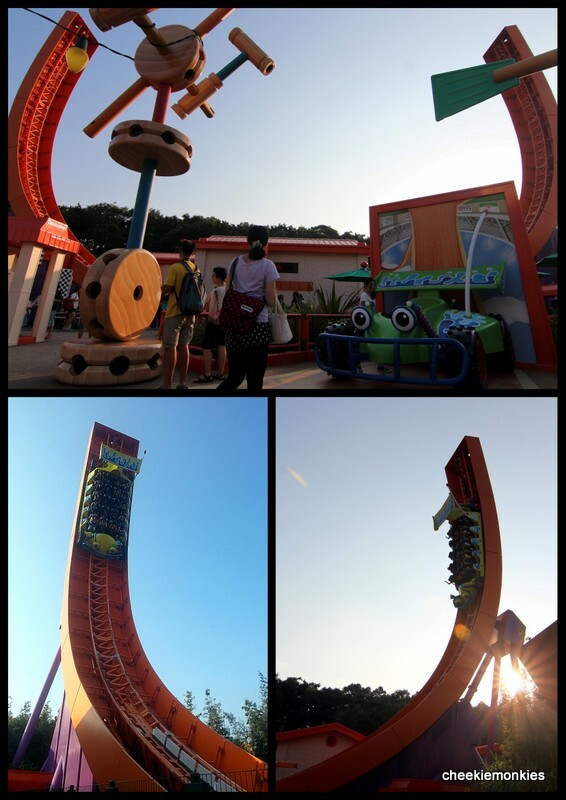 There are a total of 3 rides here - the Slinky Dog Spin, the Toy Soldier Parachute Drop and the RC Racer. To Ale's delight, she was able to go on two of those rides. I figured she would have no qualms going on the Slinky Dog Spin but what of the Toy Soldier Parachute Drop? It turned out that she was more fearless than I give her credit for. As for the RC Racer ride (Min. Height 112cm), I can tell you more but I think Ash will be able to do a competent enough job as well. And this, is the ride in question. Simply put, this was by far the most thrilling ride I have ever attempted. The U-shaped track can be rather deceiving, but let's just say when you are up there it can get very scary exhilarating! 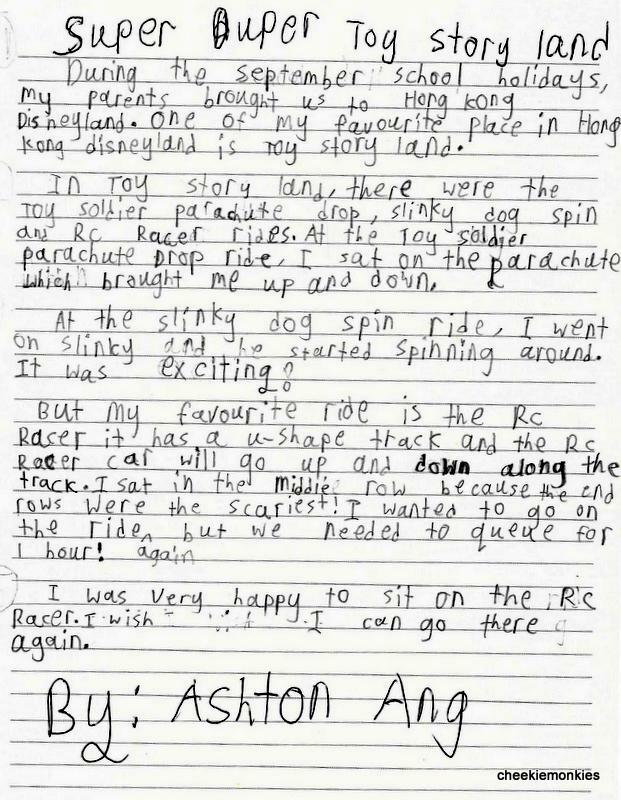 The most thrilling part of the ride has got to be when I felt myself lifted slightly off my seat on the way down... exactly why this is ranked as Ash's top ride in Hong Kong Disneyland. 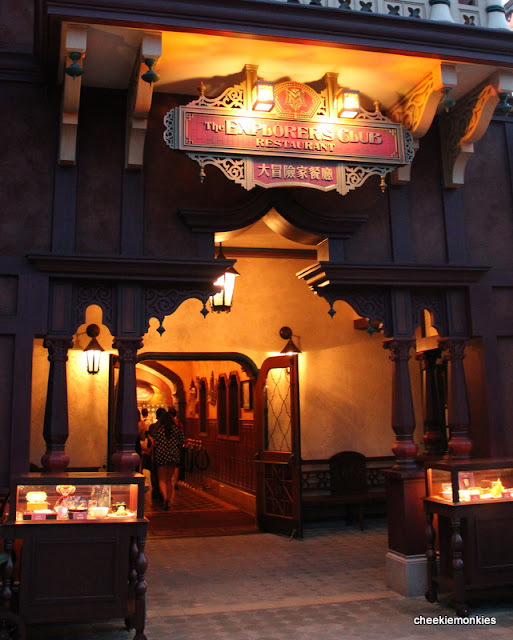 Of course, a visit to Hong Kong Disneyland will not be complete without experiencing the original attractions it has to offer too. And if you have kids who are of the same age as Ale, they will surely enjoy the Jungle River Cruise at Adventureland. The attraction simulates a riverboat cruise down the major rivers of Asia, Africa and South America, complete with animatronic beasts like hippos, elephants, cobras and orangutans. Nothing too exciting which probably explained why Ash and Ayd got a little bored towards the end, but Ale thoroughly enjoyed it. But the boys perked up when I told them we were going to catch the Festival of the Lion King next. If your kids are familiar with the animated film, they will love it. 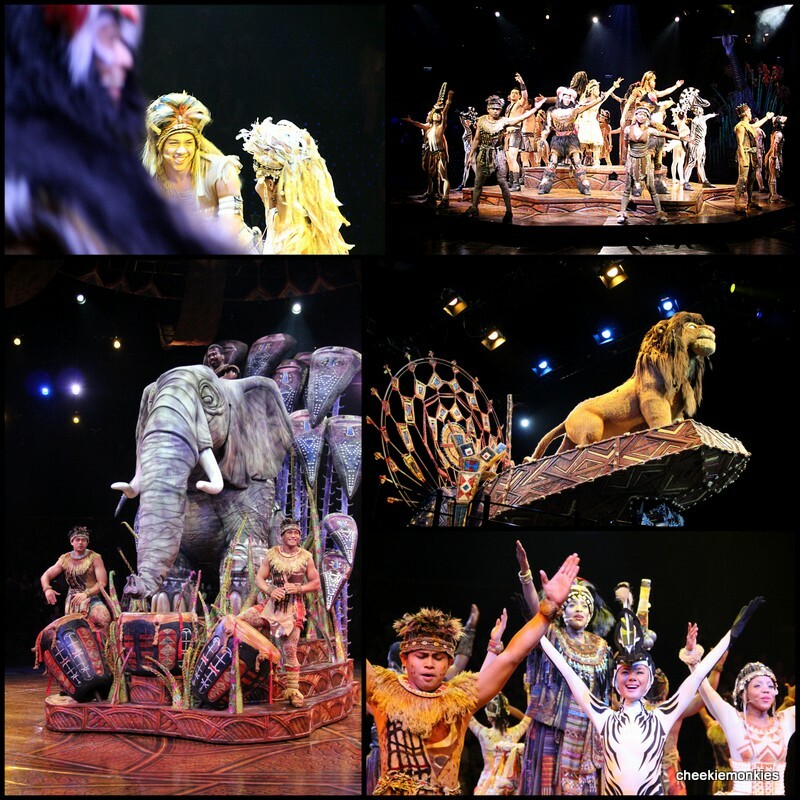 Even if they have not watched 'The Lion King' before, the sheer colours, infectious music and energetic dancing will no doubt endear them to this theatrical extravaganza. A must-watch, in my opinion. Right after, we then made our way to Tomorrowland where I can finally let my ears rest, no thanks to the boys' incessant clamouring. And that can be largely attributed to this attraction. Somehow, this has remained a perpetual fave for Ash... even after six years since his first Buzz Lightyear Astro Blasters ride. Even Ayd has become a fan now, no doubt the main draw being boasting the bragging rights of being the top blaster of the ride. Thankfully enough, this was a Disney FASTPASS attraction which meant the boys got to blast the evil Zurg to their hearts' content. The other 2 rides we would have loved to have tried were the Autopia and Space Mountain attractions. But the former had a leg-numbing waiting time of 60 minutes while the latter was closed in preparation for the park's upcoming Halloween celebrations. So no stomach-churning roller-coaster fix for the boys then. Finally, it was the turn of Fantasyland... which Ale has been patiently waiting for all these while. And it must have been well the wait, thanks to these 2 Disney Princesses. Inevitably, she is currently in her Princess-y phase and all things royal. So imagine her utter amazement at first when she came face-to-face with not one, but two Princesses. But she did regain her composure rather quickly and had her mandatory princess photo moment. For some reason, The Many Adventures of Winnie the Pooh ride always sports a long queue. 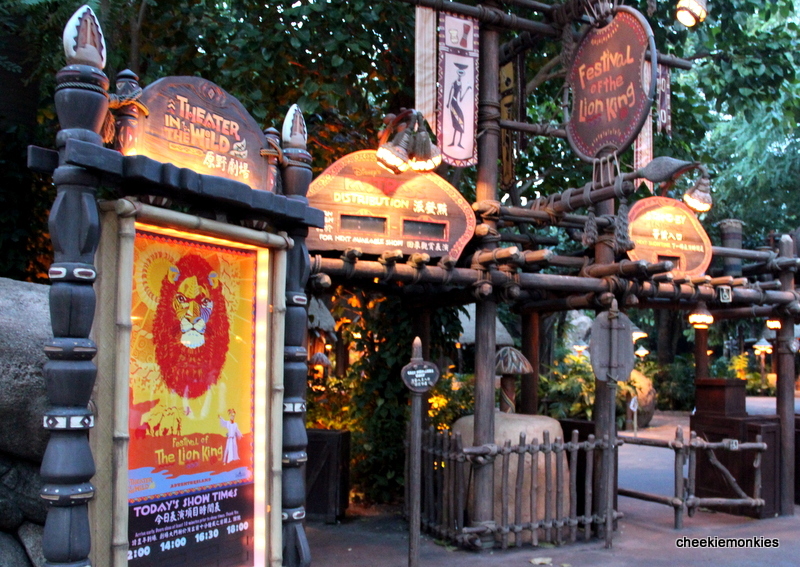 So it is a good thing too that it has a Disney FASTPASS system, seeing how the 3 monkies are huge fans of the ride. Ale then got her obligatory carousel ride at the Cinderella Carousel... though I have to add that we had to wait 30 minutes for our turn! If you had told me that I would willingly suffer in the queue amid a bunch of noisy toddlers during the pre-kids era, I would have laughed my head off. Now, I do so patiently in return for a 2-minute ride on horses that go up and down... and be rewarded with a smile that is all so priceless. The one ride which we have never been on is the classic "it's a small world" boat ride. We finally did... and did so again and again. Three times in all, all because the monkies demanded it. Come to think of it, I never realised that there were actually so many attractions in Fantasyland alone. In addition to the Mad Hatter Tea Cups and Dumbo the Flying Elephant rides, we also managed to catch a further 2 shows with the first being Mickey's PhilharMagic - a 12-minute long show featuring 3D effects, complete with scents and sprays of water. 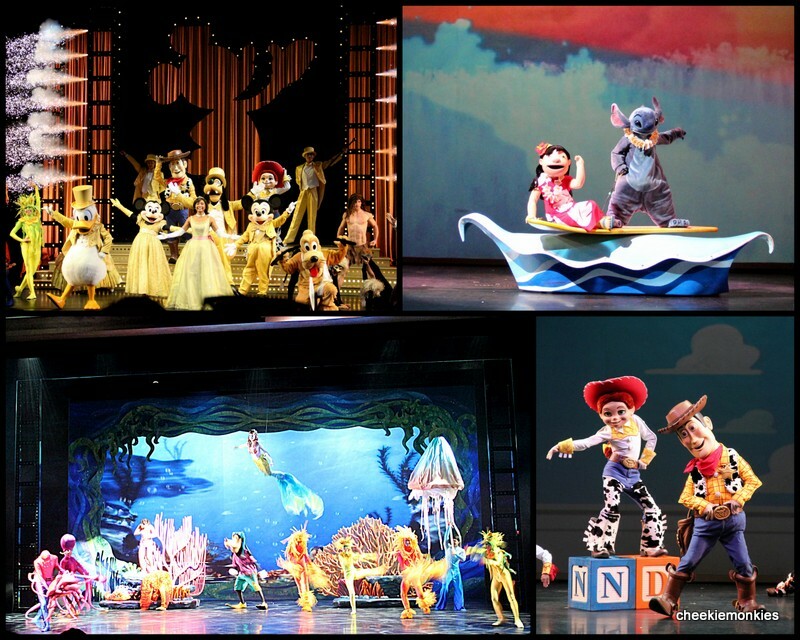 The other one was The Golden Mickeys at Disney's Storybook Theater which was essentially a musical show that showcased various songs from Disney cartoons of the past, like The Little Mermaid, Mulan, Lilo & Stitch, Tarzan, Beauty & the Beast and Toy Story. For once, there is a show that appealed to both the wifey and me more than the monkies, simply because we could identify with the songs more. But I guess that is the magic of Disney, isn't it? There is always something for everyone, be it a grown-up or child. And something that is bound to delight everyone alike has got to be the Fireworks show - an amazing end to our two amazing days at Hong Kong Disneyland. 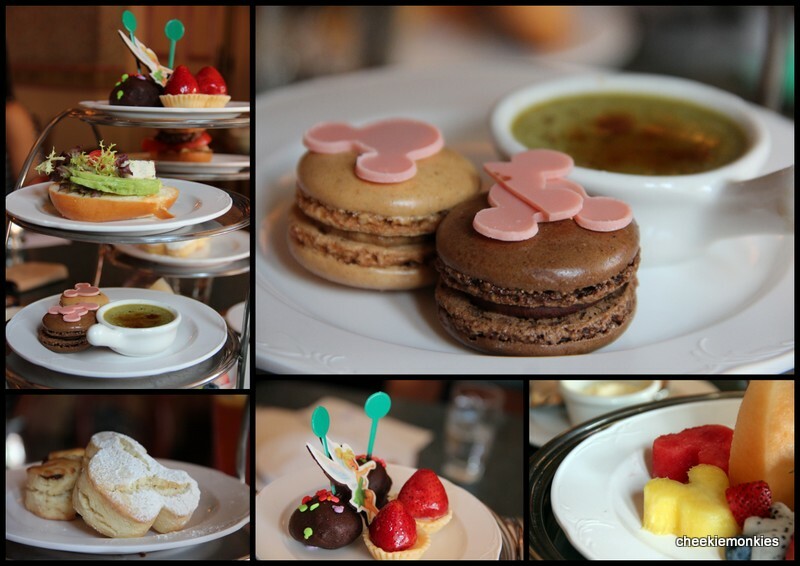 Oh, and did I mention the dining in Hong Kong Disneyland Hotel was amazing as well? 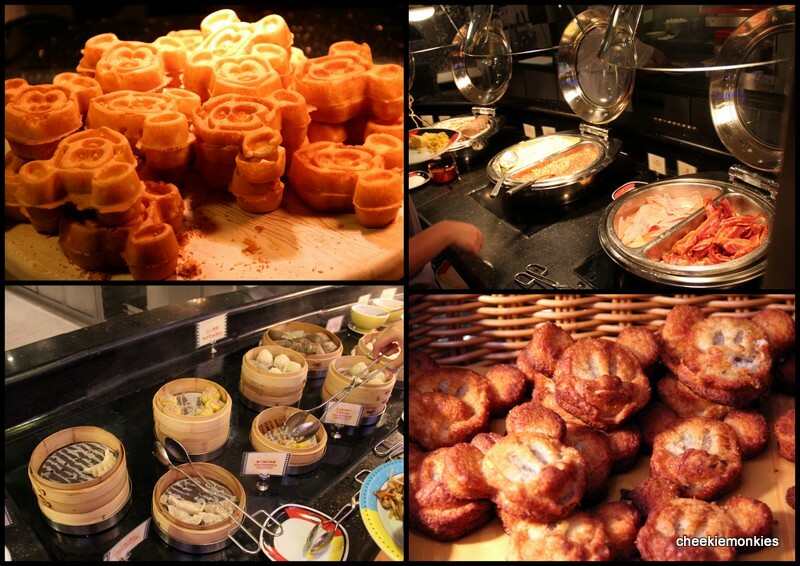 I am no food blogger when it comes to reviewing eating places but I just have to turn the spotlight to the restaurants there... simply because we had our breakfast, lunch and dinner in three different restaurants at Hong Kong Disneyland Hotel and every single one was a unique experience on its own. Breakfast was at the ever-popular Enchanted Garden Restaurant, where a fabulous international breakfast buffet awaited us. But the food wasn't the main star. This, or rather, these were. Oh yes, it is official - Disney characters make children eat more during breakfast. And quicker too. 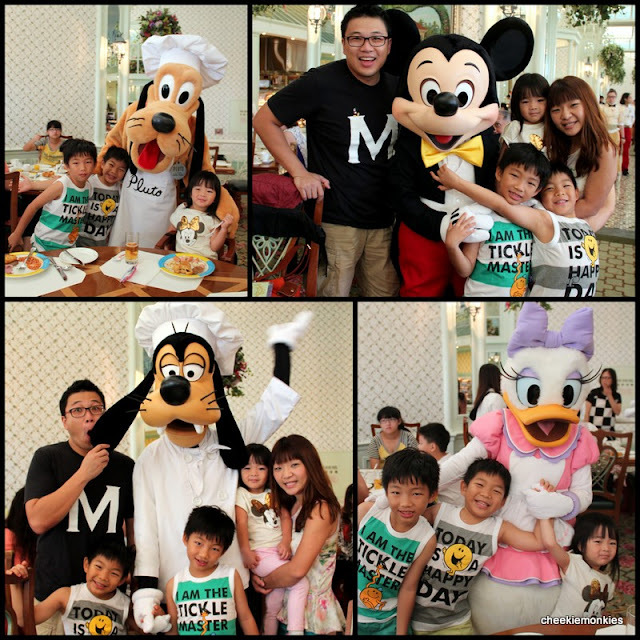 So that they would be able to have their photos taken with the Mickey and gang if they obediently finish up their breakfast. In truth, the characters will stop by every table for a photo opportunity but the kids do not need to know that. There isn't any need to rush or queue to have your photo taken as all diners will have a chance to do so... and even steal a kiss or hug, or both. On a side note, the Chef Mickey restaurant over at the Disney's Hollywood Hotel also serves up a mean buffet breakfast, albeit at a lower price. 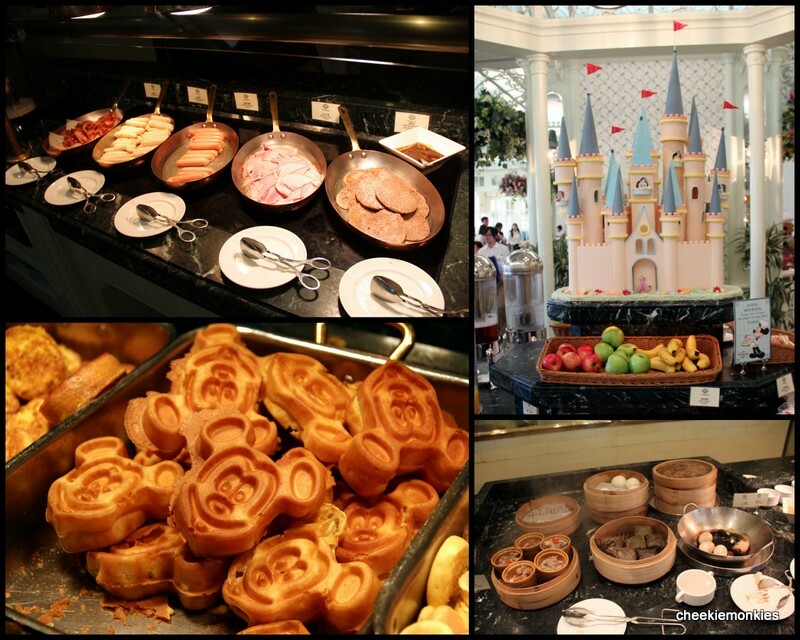 You still get a decent choice of breakfast items, with all the usual Mickey motif offerings. As well as one photo opportunity with the main mouse himself - Chef Mickey. And if you would rather consume your Disney characters than to have your photo taken with them, Crystal Lotus at Hong Kong Disneyland Hotel will be your best bet. 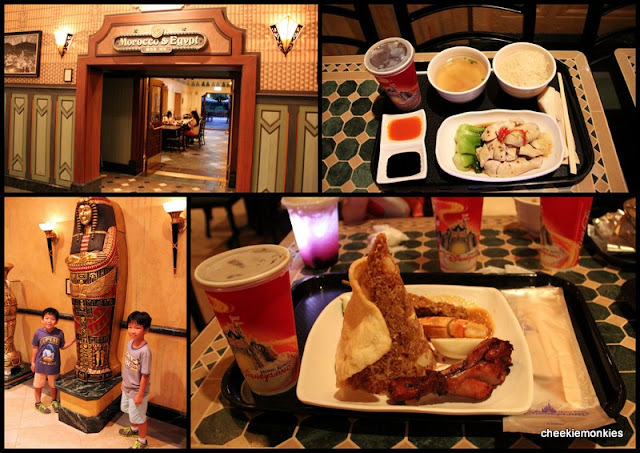 The Chinese restaurant serves up award-winning Chinese cuisines with a unique Disney touch. And if you only need one reason to dine here, its Disney’s character dim sum which is uniquely available at the Hong Kong Disneyland Resort will be it. How cute are these dim sum??? Even the winter melon in the Stuffed Whole Dried Scallops in Mickey Winter Melon Chicken Soup is shaped in the Mickey Mouse motif! Oh, and I have to give a special mention to the Baked Tasmanian Crab Meat Fried Rice in Whole Crab Shell. Other than it was served in a gold metal crab casing, it tasted heavenly! The rice, not the casing. Even Ayd, who is a bigger fan of noodles than rice, walloped his entire portion! And to think I harboured hopes of having extra servings after finishing my share. If our breakfast and lunch had bordered on cuteness overload, then dinner was the complete opposite. Our dinner at Walt's Cafe was by far the best meal we had during our stay at Hong Kong Disneyland. Admittedly, after 2 long and exciting days at Disneyland, the first thing I want to do come night time is to face-plant into the soft comfy pillow. But this set dinner just made up for all the energy-sapping queuing done with my monkies. 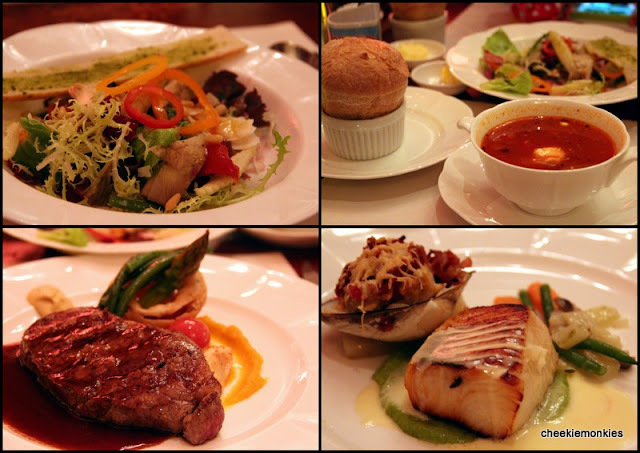 Walt's Cafe serves a fine dining menu with Western and Asian choices and its expertise clearly showed. The wifey and I had the Sirloin Steak - which was succulent and cooked to perfection - while the monkies each had the Cod Fish. I would have loved to tell you how it tasted, except that all three of them polished off every single bit of the fish before I had a chance to do so. We then rounded up the night with Rosemary Almond Apple Tart with Vanilla Ice Cream. One word - Happiness. 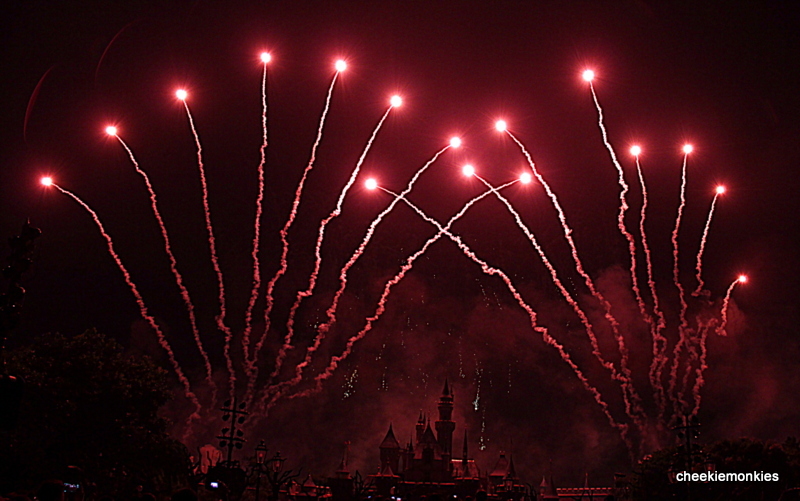 With that, it signaled the perfect end to our Hong Kong Disneyland magical experience. Predictably, all three monies were reluctant to leave when it came to checking out of our room. Ale bade for me to carry her and she gently whispered into my ear, "Papa, I love Disneyland a lot you know. Can we come back here again?" P.S. 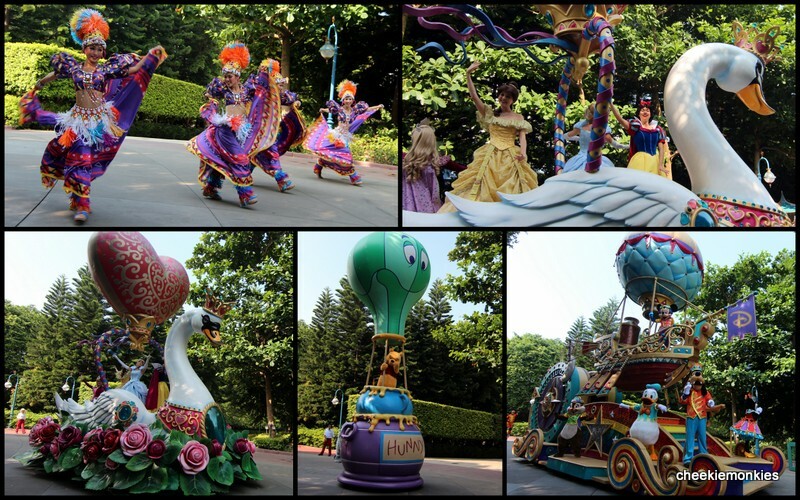 We did something entirely different after our 2 days of magic at Hong Kong Disneyland - read all about it HERE! Ale-Diva can definitely hold her own against snow white and the-other-fairy-tale-girl-in-pink. Awhs the ending makes my heart melt. Hahaha how can anyone say no ! How old are your kids? Your boys really write well. We went during the September school holidays. I'm wondering, will 1 day pass enough to cover everything or 2day pass will be better? I was told it's not so big 1 day will be more than enough, but some said otherwise.. I will definitely recommend the 2-day pass for HK Disneyland. Even though the the park is not that huge, considerable amount of time will be spent queuing for the more popular rides so a 1-day pass will make everything seem rather rushed and frantic. Hi Kelvin may I know if you stayed 1n or 2n in the hotel to cover the 2-day pass? We stayed 2 nights. Hope it helps!